Tomorrow (as I write this), 30 January is a recurring day set up for just this purpose. The basic idea is that authors pitch their completed but unsold science fiction/fantasy novels in a single tweet (well, you can tweet once per hour during the ten hour period…8:00 AM Eastern to 6:00 PM Eastern), and agents can read through the tweets (which are identified by the #SFFPit hashtag), and possibly express interest. If you are an author with a completed but unsold SFF novel, and/or an agent (hey, some people are both), I strongly recommend you read every word of the above page before pitching. If you do pitch, good luck! I’d really appreciate you letting me know if you have success, especially if you first heard about it here. Even if you don’t have success, I’d be interested to hear about your experience. Feel free to let me and my readers know by commenting on this post. * I link to the same thing at the regular Amazon site, and at AmazonSmile. When you shop at AmazonSmile, half a percent of your purchase price on eligible items goes to a non-profit you choose. It will feel just like shopping at Amazon: you’ll be using your same account. The one thing for you that is different is that you pick a non-profit the first time you go (which you can change whenever you want)…and the good feeling you’ll get. Shop ’til you help! to my readers. I think it’s the best resource for Kindle owners on the internet. One of the useful features is that you can list a book there, and get a free e-mail when it goes down an amount you specify. My Significant Other is out of town for a few days (those are always difficult days) helping our adult kid move, so it was good to have a special book to read. This is a book I’m not going to do with text-to-speech in the car, because of all the pictures I want to see. There is nothing wrong with having an opinion and including it in your writing, of course…that can be done without condemning opposing opinions, though. I may have been old-fashioned in expecting a more neutral tone in a history. Still, to be clear, I think the book is well worth it. If you need to get a gift now for someone who was a “Monster Kid” or otherwise is a fan of these movies (and Universal is starting them up again, as their own “Cinematic Universe”, a la Marvel), this is a great price! You can delay the delivery until the appropriate gift-giving occasion. Check the price before you click or tap that Buy button…it can change any time. Great illustration of the value of eReaderIQ! talking about how publishers are designing their covers to optimize sales on Amazon (which the article says now sells 45% of the books in the USA). That means the book has to stand out in a thumbnail…maybe a couple of centimeters (one inch, roughly) tall. The article has a great illustration with a bunch of current books which have yellow covers. It makes sense…you could hypothetically have different covers for e-books and p-books (paperbooks), but that would reduce the impact of multiple exposures to the same item (often necessary before someone buys it)…and they aren’t talking about just e-books, but p-books bought on Amazon. We don’t live in Walnut Creek (across the Bay from San Francisco and farther east than Oakland), but I do work there sometimes. 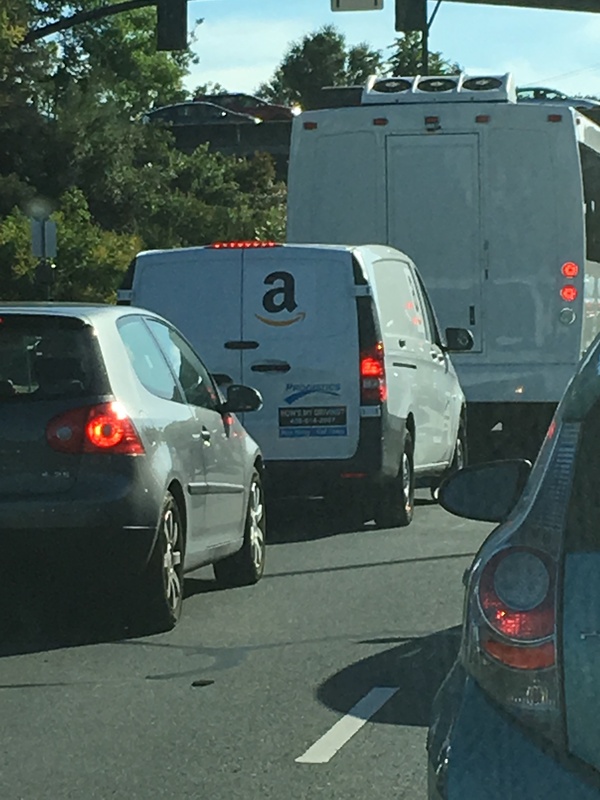 just starting up delivery there. That means that I could hypothetically be at work, and order, say, a Nylabone chew toy for the dogs and get it within two hours…at no additional cost beyond our Prime membership. in hand in two hours…one hour, if we are willing to pay $7.99 (I haven’t checked, but I assume that’s available in Walnut Creek). There’s what looks like a weekly 50% off section, and I get $10 back on the first order. which is the basic Kindle, plus a cover, plus a better warranty than you usually get…and it’s $89.99 right now. With royalties, is flat where it’s at? How authors get paid may seem esoteric, but it has a huge impact on what you read. Not every author makes their living writing…but for the ones that do, how they get paid, and how much they get paid affects not only whether they write at all (or give it up and get a different sort of job/income stream), but what they write. Back in the pulp days, authors might get a penny a word…and the same pulp magazine wasn’t going to publish five stories from the same author in the same issue. That meant that authors might write in a wide variety of genres and under a number of different pen names, just to get as much published as they could. For example, Robert E. Howard, best known for Conan the Barbarian, wrote boxing stories (I’ve read some…bought them with a misleading cove, but I did enjoy them), Westerns, detective stories, comedies…even “spicy” stories. When an author (often through an agent, traditionally) licenses the rights to a publisher, it’s for a specific format or formats. One publisher might have the hardback rights and another one might have the paperback rights (less common today than it used to be). E-books are a relatively new format (Amazon turned it from fringe to…somewhat mainstream in late 2007), so new negotiations and new rates are involved. That’s all been pretty confusing and in flux. What is the right royalty rate for an e-book? Should it be based on the suggested retail price (the list price), on what was actually paid for it, or on the profit? What about an advance…should that be like a hardback? Oh, a couple of quick term definitions. A royalty is something paid to the author for each book sold (I’m keeping this simple). An advance is something paid by the publisher to the author before the first book is sold. The publisher then keeps the royalties from sales until they equal the advance. That’s usually something for either well-known, “brand name” authors, or perhaps a celebrity who doesn’t usually write books (someone involved in a scandal might get one). The advance may happen before the book is even written…which might allow the author to not have another job while writing it. Different pay method are being explored and suggested. looks at the idea of a “flat rate” across formats…authors would get the same rate for a sale, whether it was an e-book or a p-book. I have a tough time seeing how that would work. Oh, I suppose it could work if it was all based on profit, not list price or sale price. Otherwise, the publisher has different cost burdens for different formats. Authors would generally not want something to be based on profit, because you effectively have to trust the publisher on that. Many an actor who took a percentage of the box office was surprised when somehow, a blockbuster movie didn’t make any profit. 😉 The studio might charge expenses (like sets and costumes) for a whole franchise to a single movie’s costs, for example. I had something like that happen to me. I was managing a game store…hadn’t been there long. As the manager, I got a bonus based on the holiday sales. I was doing well…yes, I was working 120 hours a week (I didn’t want to make my assistant managers work 80 hours a week on their salaries, so I opened and closed the store all the time), but my Significant Other and I figured we had a hefty bonus coming. Authors and agents don’t want surprises. In the article, they talk about maybe a 50% royalty rate for e-books. That brings up the challenge for publishers. Authors can independently publish through Amazon, and by meeting certain not complicated guidelines, get seventy percent. That means that publishers certainly don’t have all the power in the relationship. Amazon’s terms are very clear, generally easy to understand for a newbie. They revolutionized the pay cycle, with authors getting paid more often. Right now, authors who already have successful relationships with traditional publisher are understandably reluctant to switch away to something which is still developing. New authors, especially agentless ones, won’t have the same reluctance. What do you think? Can traditional publishers continue to offer services to authors which are worth the writers getting lower royalties? If you have PrimeNow in your city, why do you ever go to a store for something it carries? Will we see the end of intricate book covers? Feel free to tell me and my readers what you think by commenting on this post. How do you feel about pay per page read? While certainly, there has been some pushback on it…in particular, from authors (and in some cases, their agents), who feel like it might radically reduce their royalties. It will also likely increase royalties for other people. Before the new plan (which went into effect July 1st), all borrows in Kindle Unlimited (from publishers using Amazon’s Kindle Direct Publishing) shared a pool of money, based on the number of borrows. Whether a title was three hundred pages, or three pages, everybody got the same amount. The only requirement was that a borrower read 10% of the titles. Let’s say the books had the classic 250 words per page. That three page book had 750 words…so 75 words would be enough for payment (you’ve read twice that many in the post already). The three hundred page book had 75,000 words…so, 7,500 words (thirty pages) before someone got paid. It’s different, but making the longer book more valuable seems reasonable to me. Note also that it’s not just that the book is longer…it’s that the reader actually read more of it, presumably getting more value out of it. I’ve been trying to come up with analogies for this, to help me understand it. I wanted to know why someone would be passionately opposed to it. Suppose you wanted one bottled water. Further suppose that you could only buy a six pack. Does it seem reasonable that the person who drank one bottle and threw away the rest paid the same amount as the person who drank and got value out of the six bottles? How about at a restaurant? Would you shop at a restaurant where you always had to pay for a salad, soup, appetizer, main course, and dessert, even if you only wanted the salad? People do order “prix fixe”, where they pay one price for several courses. On the other side, I can see the argument that if you order a medium pizza and only eat two slices, the restaurant still had to make the whole pizza…it’s not their fault if you don’t eat the whole thing. That doesn’t feel quite the same, though…the restaurant used up resources on the pizza. The writer did use resources (time, creative energy), but it’s not limited in the same way. I want to hear from you, my readers, as to what you think about it. You can certainly make comments on this post, and I’m going to do a poll. Tell me why you don’t like it, or why you do. For as long as anyone in the publishing business can remember, it’s been about selling books. It hasn’t actually mattered if anyone read the book or not…just whether they bought it. Oh, sure, if someone read it (and enjoyed it), you were more likely to get good word of mouth out of it, which could result in more sales, but when you are looking at the initial calculations, it’s just the purchase that matters. and KOLL (Kindle Owners’ Lending Library) programs (through KDP Select). They took a step in the new direction with KU originally, when someone had to read ten percent of a book which was borrowed before the publisher (which might be just the author) got paid for the borrow. That was more of a threshold thing, though. You have to prevent someone from borrowing a bunch of books and not reading them, just to get the author (who might be a friend) a royalty. In the new system (starting July 1st), you get paid based on the number of pages read. That completely up ends the game! A book has to be good…all the way through…for you to get the maximum payment. The current KU system has benefited short “books”. I wrote about that before: how, for example, a winning strategy would be to break a book on ten great TV series into ten separate books. Amazon is smarter than that. “To determine a book’s page count in a way that works across genres and devices, we’ve developed the Kindle Edition Normalized Page Count (KENPC). We calculate KENPC based on standard settings (e.g. font, line height, line spacing, etc. ), and we’ll use KENPC to measure the number of pages customers read in your book, starting with the Start Reading Location (SRL) to the end of your book. Amazon typically sets SRL at chapter 1 so readers can start reading the core content of your book as soon as they open it. I’m sure they’ll also take into account reading speed in some way so you can’t just flip through the screens. I suspect they’ll also be able to tell if you bounce around. If you are reading an anthology and skip a story, I assume that story won’t count. In other words, you can’t just jump 100 pages into it and give the publisher credit for 100 pages read. While this currently only affects borrows, I think readers would like it if it was also the case with purchases. Wouldn’t you just love this? No padding in an anthology. No clunker pieces in a non-fiction collection. Of course, I’m portraying it in its best possible light…I tend to do that. 😉 I’m assuming Amazon will count actual pages read (by judging how long you stay on a page…our devices can already calculate our reading speed). If they don’t, we could get a lot of filler. Another negative might be that it could be harder for new authors to get exposure. One way that happens now is that you stick an untested author’s story into an anthology with other better-known works…sometimes with public domain works. However, there is one more very interesting thing about this to me. You can’t do it with p-books (paperbooks). That could really create a bifurcated system…what makes you money in an e-book might not be what makes you money in a p-book…and vice versa. A great (and perhaps misleading) cover could work in a p-book…but if only gets people to read the first ten pages, it could fail as an e-book paid by the page. This could lead to a much greater degree to books published in only one of the two formats. If you are only going with one, I think you are going with e-books (much lower risk). I’m not going to say that’s part of the secret agenda here, but it’s fun to speculate…. One last thing: in a way, this is a throwback to the pulp era when authors were paid by the word. Not the same, of course. In this case, it’s not that you benefit purely from tremendous output in a variety of genres (which was the case for many writers back then), but only if people actually read it. What do you think? If you are a reader, what do you think about this? If you are an author? Publisher? What flaws are you seeing in the idea? I didn’t address this, but does it mean the money will come in more slowly? For example, I read some books over the course of years…a chapter here, a chapter there. I might love a book like that, but use it as a “palate cleanser” between novels. As I think about that, is that bad for an author/publisher? It would be like getting residuals from having done a sitcom on TV…lump sums (like big advances) can help finance the next book, but this could help you have a smaller amount of money all the time…could help you live. Oh, and what does this do to advances, if it spreads over to purchases? Would they not give you a big advance if they didn’t know people would read the whole book? That could affect certain brand name authors, who shall remain nameless. 😉 I definitely want to hear from my readers on this…feel free to share your thoughts with me and my other readers by commenting on this post.